Take a poll of political pundits about next year’s presidential election, and most at this point would probably predict that President Barack Obama would win reelection, but with a reduced margin from 2008 in both the popular and electoral vote. Yet if that actually happens, it would be an historical rarity of the first order. 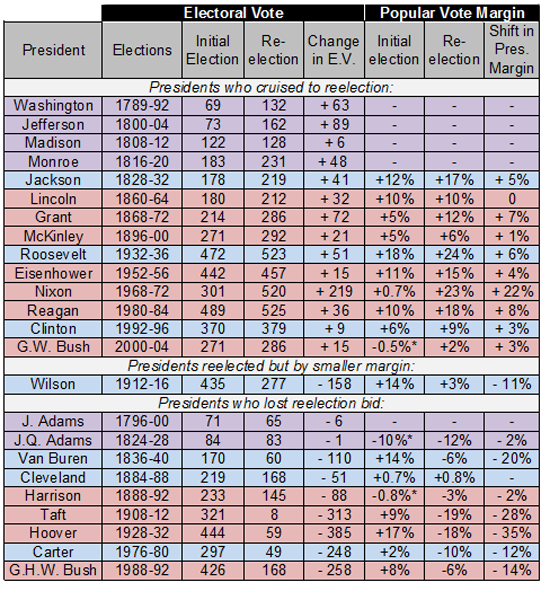 Most presidents seeking reelection cruise to victory with a larger margin than their initial triumph four years earlier. Some lose their bid for a second term. But only one president thus far has “thread the needle,” so to speak. And that is Democrat Woodrow Wilson. He won the White House easily in 1912 as a result of a horrific split in the Republican Party, then was narrowly reelected in 1916 when the GOP was relatively united. In the course of four years, Wilson’s winning margin in the popular vote shrank from 14 percentage points to 3, his electoral vote total dropped from 435 to 277, and the number of states that Wilson won decreased from 40 to 30. Yet that he won at all in 1916 was no small feat. The personally prickly but intellectually brilliant former Princeton professor and New Jersey governor provided the lone Democratic interlude in a Republican presidential era that ran from 1896 to 1932. So dominant was the GOP in this period that it won clear-cut presidential victories in the four elections before 1912 and the three elections after 1916. In this political milieu, virtually the only time a Democrat could win was when the Republican Party was split, which was the case in 1912. In what was probably the greatest intra-party bloodletting in the last century, the GOP essentially ended up with two nominees – President William Howard Taft, who won the official party nomination with the help of its conservative leadership, and former President Theodore Roosevelt, who championed more liberal GOP elements on the insurgent Progressive (or “Bull Moose”) Party line. Taft and Roosevelt together combined to take a majority of the popular vote. But with the Republican vote split, Wilson handily won the election with a modest 42% share. Four years later, that huge advantage for Wilson and the Democrats largely evaporated. The Progressive Party essentially disappeared when Roosevelt declined its invitation to mount another third-party campaign in 1916. And Republicans found a respectable nominee in Charles Evans Hughes, who had the credentials to bridge the gap between the warring factions. Hughes had been elected governor of New York a decade earlier, where he earned a reputation as a reformer. And as an associate justice of the Supreme Court after that, he was fortuitously removed from the slings and arrows of Republican politics in 1912. Yet while there was seeming peace within the GOP at the national level in 1916, bitterness existed between the factions in a number of states. No more was that the case than in California. When Hughes made a campaign swing through the state, he was shepherded by party stalwarts and kept away from the progressive Republican governor, Hiram Johnson. Arguably California’s most popular politician, Johnson would go on to easily win election to the Senate in November 1916 at the same time that Hughes would narrowly lose California, and the presidency. President Woodrow Wilson scored one of the narrowest victories of any presidential candidate in the last century. That was particularly the case in the Electoral College, where his 23-vote triumph was the smallest for any presidential winner between 1876 and 2000. It was achieved with an almost complete reversal of the current electoral map. Democrat Wilson swept the South, the Mountain West and virtually all of the Plains states, as well as much of the Pacific Coast. Meanwhile, Republican Charles Evans Hughes carried nearly all of the industrial Frost Belt states from New England west through the Midwestern heartland. In short, Wilson was essentially the champion of rural America in 1916; Hughes, of urban America. Source: Guide to U.S. Elections, Volume 1 (CQ Press). Yet even with these significant assets working on Wilson’s behalf, the election was not decided until all the ballots were counted. Wilson actually went to bed Election Night believing that he had lost, as the early returns from the Northeast and the Midwest showed a strong tide for Hughes. But late in the evening, results from the pro-Wilson states west of the Mississippi began to trickle in, and when the incumbent woke up the next morning, the election was in doubt. Only when the results from California showed Wilson the winner by barely 3,000 votes out of nearly 1 million cast was the president safely reelected. In the process, the nation had barely avoided an Electoral College “misfire.” Hughes would have been elected president if he had carried California in spite of a nationwide deficit of more than a half million in the popular vote count. 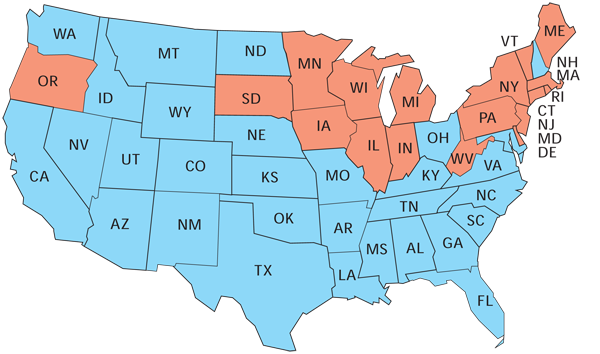 The electoral map in 1916 showed a geographic alignment virtually the opposite of nowadays. Republican Hughes dominated industrial America, winning all but Maryland, New Hampshire and Ohio in the swath of states from New England westward to the upper Midwest. Meanwhile, Democrat Wilson swept agricultural America – the South, all of the Plains states except South Dakota, and all of the western states except Oregon. The “solid” South was firmly in the Democrats’ corner in the early 20th century. Carrying most of the terrain west of the Mississippi River was more of an achievement for Wilson, and was credited to the significant progressive and anti-war sentiment in much of this sector. The peace-oriented tenor of the Democratic campaign seemed to resonate well among women voters as well, who were allowed to cast ballots in the 1916 election in a number of western states. In describing the geographical breadth of Wilson’s reelection victory, one observer called it “the combination which made Jefferson and Jackson. It is the South and the West united.” It proved, though, to be a fleeting coalition for the Democrats. Four years later, the success of the party’s presidential ticket was once again limited to its long-time base in the South. In looking ahead to 2012, Obama has one big asset and one large liability that Wilson did not have in 1916. Obama’s advantage is that the current political era is not Republican-dominated as it was a century ago. If anything, the Democrats may have a slight edge. They have won three of the last five presidential elections, and the popular vote in four of them. Since 1992, the Democratic candidate has won at least 251 electoral votes in every election, due to the party’s strength on the two coasts and its competitiveness in the industrial Midwest. If the Democratic base remains as potent next year, Obama would have a strong starting point for reelection. Yet at the present juncture, he does not hold the favorable political hand that Wilson did in 1916. The latter was able to accent his progressive activism in domestic affairs and his prudent hesitation when it came to sending American troops into military action overseas. On the other hand, Obama’s political fate in 2012 is tied to a sluggish economy, which is not much better now than it was in 2010 when the Democrats suffered huge midterm election losses. Next year, Obama could encounter any of the three outcomes of a president seeking reelection – a big win, a loss, or a narrower victory than the one he registered when he first won the White House. If it proves to be the third of those three possibilities, it will be yet another historic wrinkle for Obama’s political resume. Most presidents who have sought reelection have faced two possible outcomes: They have either cruised easily to another term or they have lost. Rare is the president who has weathered a third possible outcome – a successful reelection, but by a substantially reduced margin from their initial presidential election victory. Yet that is the outcome that many political pundits are predicting for Barack Obama in 2012. The last to execute such a feat, Virginia’s own Woodrow Wilson, glided to victory in 1912 over a divided Republican Party, but narrowly won reelection four years later over a relatively united GOP. Notes: Presidents are color-coded as blue (Democrat), red (Republican) or purple (pre-modern party). An asterisk indicates candidates who won the presidency despite losing the popular vote. This chart does not include presidents who assumed the White House upon the death or resignation of their predecessor or did not seek reelection. Both Thomas Jefferson in 1800 and John Quincy Adams in 1824 were elected by the House of Representatives. Franklin Roosevelt was reelected three times, but only his first reelection is included here. George W. Bush is included among those presidents who “cruised” to reelection, since both his electoral vote and popular vote improved in 2004 from his first election four years earlier. The popular vote for president is readily available only since 1824. The nationwide electoral vote total steadily increased until 1912 when it reached 531. Presently, there are 538 electoral votes. Source: Guide to U.S. Elections, Volume I (CQ Press); America Votes 28 (CQ Press).